Five mice race down a track speeding around turns, cruising over jumps, and running into a few obstacles. They will need more than just speed to become the winner of this race! With minimal words and lively illustrations Honk! Splat! Vroom! is an easy and fun story to read. My toddler loves it! If you’re interested in reading Honk! Splat! 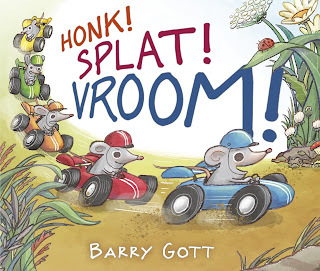 Vroom!, you can purchase a copy here on Amazon.